The East Bay MET Center project consisted of approximately 20,400 square feet of new construction, including outdoor program spaces on the balconies. 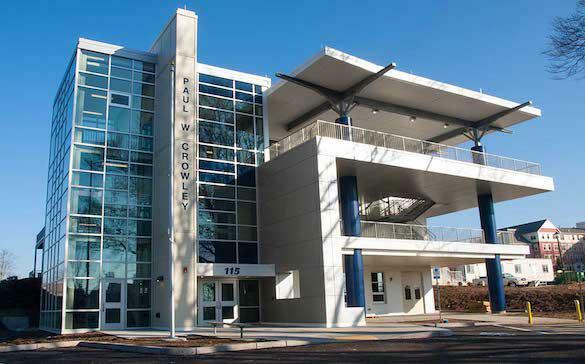 This innovative school facility was designed and constructed to be net-zero ready with a predicted site energy use intensity (EUI) of 35,000 Btu per square foot annually (35kBtu/s.f./yr). This low EUI was achieved by taking advantage of passive opportunities including on-site solar and geothermal systems as well as the high-performance building enclosure. Active energy efficiency measures included high-performance HVAC systems, LED lighting, and automatic lighting controls. The staff and students of the school are committed to the efficient use of the facility and to exploring innovative ways of using the building to teach and learn about sustainability, green technologies, and the environment. Stephen Turner Inc. provided comprehensive design, construction, and first-year monitoring commissioning services from 2011-2014 to meet the Northeast Collaborative for High-Performance Schools (NE-CHPS) prerequisite and elective credit commissioning requirements. Stephen Turner Inc. was hired in pre-design to provide value-added commissioning services to the Met Center, including early system concept development and recommendations directly for the owner. The commissioned systems included a dedicated outdoor air unit with energy recovery, high efficiency condensing boilers, solar thermal domestic hot water system, lighting control system and Building Automation System. Stephen Turner Inc. also provided an electronic Systems Manual for use by operators and maintenance personnel to increase the persistence of building performance measures in support of the projectÍs net-zero energy use goal. This highly customized Systems Manual compiled all critical information for the commissioned systems, including system descriptions, nameplate information, sequences of operation, operating setpoints and operating considerations into a single, user-friendly, hyperlinked electronic file.